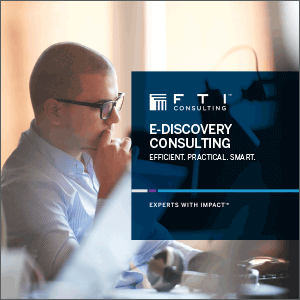 FTI Technology helps clients meet their dynamic legal and regulatory challenges with innovative e-discovery solutions. From maximizing the use of in-house tools, to managing the entire process as an outsourced managed service, FTI Technology offers a broad range of flexible solutions that focus not only on the technical tools, but also on the policies and procedures that support the entire process. 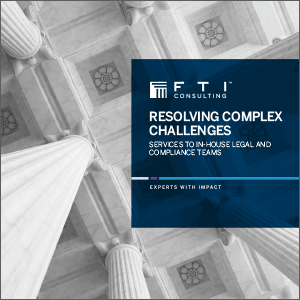 Spanning massive data sets, multiple custodians and global locations, Hart–Scott-Rodino (HSR) Second Requests can easily overwhelm an organization—pushing a legal team outside of its comfort zone to face unfamiliar challenges. And when the penalty is a large fine or even a failed merger, the stakes cannot be higher. With more than 50 matters successfully completed, we are a tested and proven guide through the Second Request process. 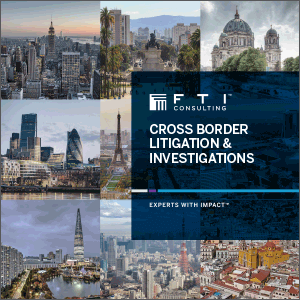 Litigation and investigations are increasingly global in scope and can expose unprepared teams to risk. Organizations that do business outside the U.S. or with foreign entities face the necessity of dealing with data in international jurisdictions for discovery, regulatory requests and internal investigations. Unique problems come along with this necessity - including data privacy issues, security concerns, language and cultural barriers and logistical headaches. 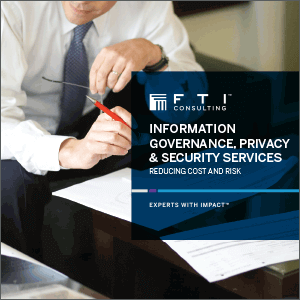 FTI Technology’s Information Governance, Privacy & Security (IGP&S) services provides the people, process and technology to deliver concrete improvements with demonstrable value for organizations. 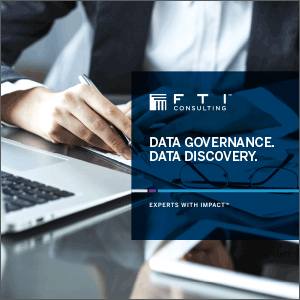 We assist in developing, implementing and documenting information governance programs that reduce corporate risk, secure data, improve the e-discovery process and enable faster and deeper insight into data. By 2012, the European Commission put forth a proposal to reform the legislation, as a response to new challenges in the protection of personal data and represent the Digital Age. 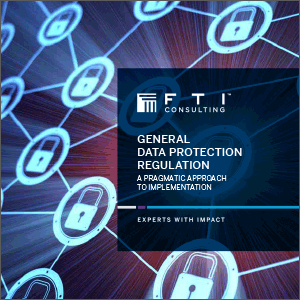 On the 4th May 2016 the EU officially published the General Data Protection Regulation (GDPR) with a view to implementing harmonised data protection legislation across Europe. The GDPR will be enforced from the 25th May 2018. Reliance on personal data grows and companies continue to innovate against a backdrop of enhanced privacy regulation, changing consumer privacy expectations, and shareholder demands for profitability. As a result, today’s organizations face a profoundly complicated regulatory, reputational, and operational data privacy risk environment. 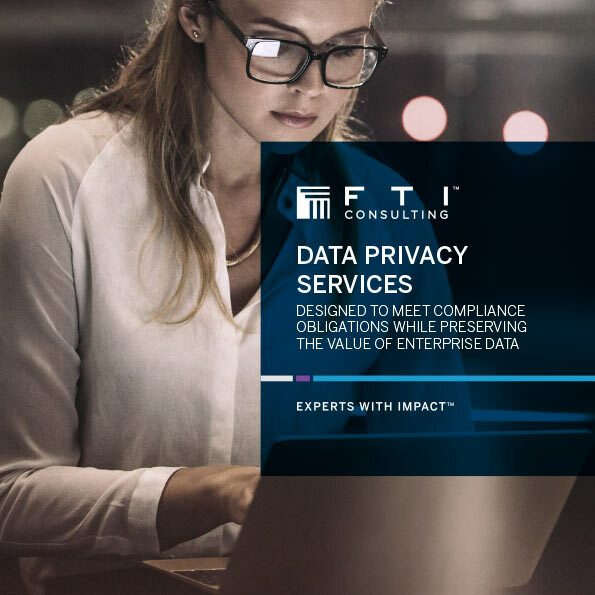 FTI Consulting’s Information Governance Privacy and Security team delivers practical business solutions that not only help organizations reduce the risk associated with privacy compliance obligations, but also recognize value in their personal data. Cost-effectively find, understand and act upon enterprise contracts: The average Fortune 1000 company actively manages tens of thousands of contracts at any one time. These dense, complex and often-changing documents touch every aspect of a business, impacting clients, employees and shareholders. 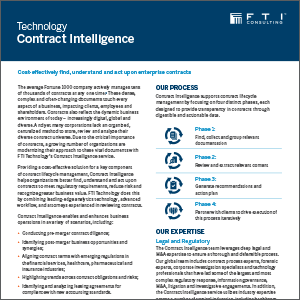 Due to the critical importance of contracts, a growing number of organizations are modernizing their approach to these vital documents with FTI Technology’s Contract Intelligence service. 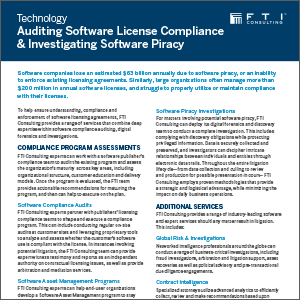 Software companies lose an estimated $63 billion annually due to software piracy, or an inability to enforce existing licensing agreements. Similarly, large organizations often manage more than $200 million in annual software licenses, and struggle to properly utilize or maintain compliance with their licenses. 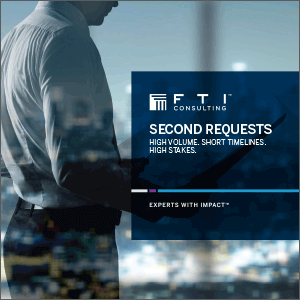 To help ensure understanding, compliance and enforcement of software licensing agreements, FTI Consulting provides a range of services that combine deep expertise within software compliance auditing, digital forensics and investigations. FTI Consulting is one of the pre-eminent expert-driven consulting firms in the world. Since our founding over 35 years ago we have been the trusted advisor to many companies during some of the most memorable events in recent history, including landmark legal cases, international PR crises, cross-border restructurings and multi-jurisdictional investigations. 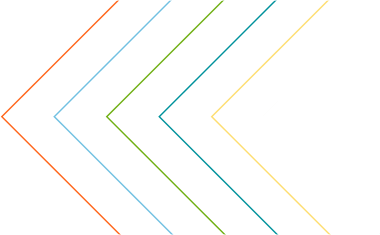 Our experts advise clients on a variety of compliance, reputation, financial and regulatory matters, and are able to help across all stages of the business life cycle, from growth to restructuring and from crisis to investment. 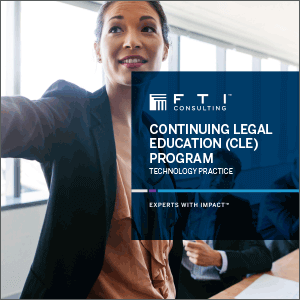 FTI Technology is pleased to offer CLE courses to your legal team. Please contact your regional business development representative to schedule an event. CLE credits are pending certification in your jurisdiction.